The Associates work best in small doses, a single or two, and an LP's worth can be heavy going. Given their liking for oppressively weighty rhythms and a dense pudding of a sound it needs a big appetite. 'Fourth Drawer Down' is a German collation of some of their numerous A and B sides. Hardly a month seemed to go by last year without a new Associates 45 appearing: a hunger to display growth or a compulsive's diary of work? The best entry, maybe, was 'Tell Me Easter's On Friday'; here it's dressed in a bass heavy mix that plunges the carillon instrumentation into a dungeon. The following 'The Associate' goes even deeper, a circular tune gradually overwhelmed by clouds of pain. This might be construed as the nucleus of Associates music, with Billy Mackenzie's booming prophet vocals, the frugally rationed space and the grisly metallics of songs like 'A Girl Named Property' or 'Kitchen Person'. As that terrific onrush winds on, though, you wonder if there is humanity left there. Play 'Fourth Drawer Down' very loud and it assumes the dimensions and ambience of a breakers' yard in an abandoned metropolis. No, wait, I like The Associates. There is more here. 'Q Quarters' calms down and discovers consternation in oriental chords. 'White Car In Germany' and its instrumental half-brother 'An Even Whiter Car' depict wanderings in an alien-nation which accurately evoke a spectator's fascinated forebodings. 'Message Oblique Speech', with its fractured jigsaw of rhythms and mutant electronic asides, musters a weird exultation. There is no let-up from the first to last. 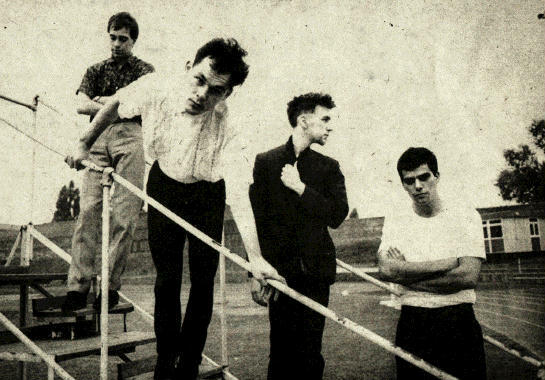 The Associates delight in insistence in these songs. Lyrics are often scarcely decipherable; when they are it's fruitless trying to unravel the songs. The Associates brutalise form with a purpose, though. In trying to dismantle the accepted notions of organised playing and reconstructing with uncaring regard for accessibility - all these tracks are cluttered, confused and strewn with near-random noise - The Associates reassert their humanity in electric music. At the centre of 'A Girl Named Property' Alan Rankine has his guitar repeat a chord that sounds like a baleful cry. The Associates must go on in this vein and achieve a greater clarity yet.